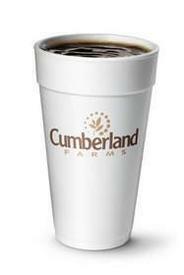 Free Coffee Fridays at Cumberland Farms!! Some folks swear by Starbucks. Others are devotees of Dunkin’ Donuts coffee. In the highly competitive world of java and joe, it’s easy to be overlooked. To help its Farmhouse Blend stand out from the crowd, Cumberland Farms is cranking up Free Coffee Fridays, starting today and running every Friday through Nov. 30. Large or small --- it doesn’t matter to Cumberland Farms, the Framingham-based chain of convenience stores and gas stations. All coffees are free during this Free Friday promotiion --- at least as long as supplies last, the chain said. “We’re so convinced that you will love our coffee that we’re giving it away!” the chain said in a press advisory. A tony barista can charge a hefty premium for an upscale joe, but Cumberland Farms wants the public to know that it charges just a “wallet-friendly” 99 cents for a coffee, any size and any day of the week (except, of course, on Free Coffee Fridays). Here’s the official low-down on Farmhouse Blend: It’s made from 100 percent Arabica beans, and as a result, it is a “mellow, medium blend with a unique balance of aroma, body, and flavor” that will “wow your taste buds and your wallet,” Cumberland Farms says.